The detection of physical forces is one of the most complex challenges facing science. Although Newton’s apple has long solved the problem of gravity, imaging the physical forces that act in living cells remains one of the main mysteries of current biology. Considered to play a decisive role in many biological processes, the chemical tools to visualize the physical forces in action do not exist. But today, researchers from the University of Geneva (UNIGE) and the NCCR in Chemical Biology have developed probes inspired by lobster cooking, they enable to enter into cells. For the first time, physical forces can be imaged live inside the cells. These results, a turning point in the study of life sciences, can be found in the Journal of the American Chemical Society. Since its creation in 2010, one of the central objectives of the NCCR Chemical Biology has been to solve the problem of detecting cellular physical forces. 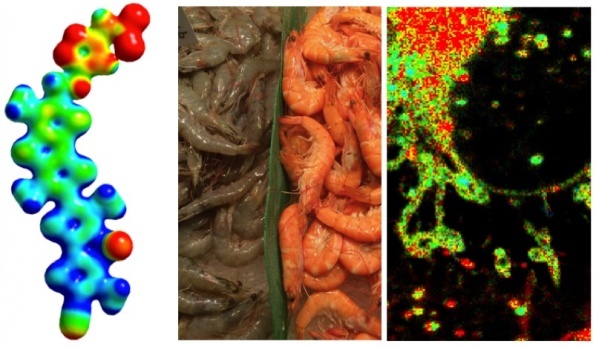 “Our approach to creating tension probes was inspired by the colour change of shrimp, crabs or lobsters during cooking,” says Stefan Matile, Professor in the Department of Organic Chemistry at the Faculty of Science of the UNIGE and member of the NCCR. In live shrimp, the physical forces of the surrounding proteins flatten and polarize the carotenoid pigment, called astaxanthin, until it turns blue. “During cooking, these proteins are unfolded and the lobster pigment can regain its natural dark orange colour,” continues the Geneva chemist. Intrigued by these crustaceans, the development of fluorescent probes operating on the same principle of planarization and polarization required about eight years of research. Antoine Goujon, Adai Colom, Karolína Strakova,Vincent Mercier, Dora Mahecic, Suliana Manley, Naomi Sakai, Aurélien Roux, and Stefan Matile, “Mechanosensitive Fluorescent Probes To Image Membrane Tension in Mitochondria, Endoplasmic Reticulum, and Lysosomes“, JACS, doi: 10.1021/jacs.8b13189.